Do I Need To Do a Freediving Course? Freediving is a very easy sport to get into. Many freedivers and spearfishers get into the sport by learning from friends and family, but this can carry serious risks if they’re not learning from a qualified instructor. Freediving appears to be relatively simple, but there is a lot of information on safety, physiology, and technique to learn and it is easy to get wrong. We recommend that everyone who wants to freedive should do a recognized course with a qualified instructor from an insured agency. 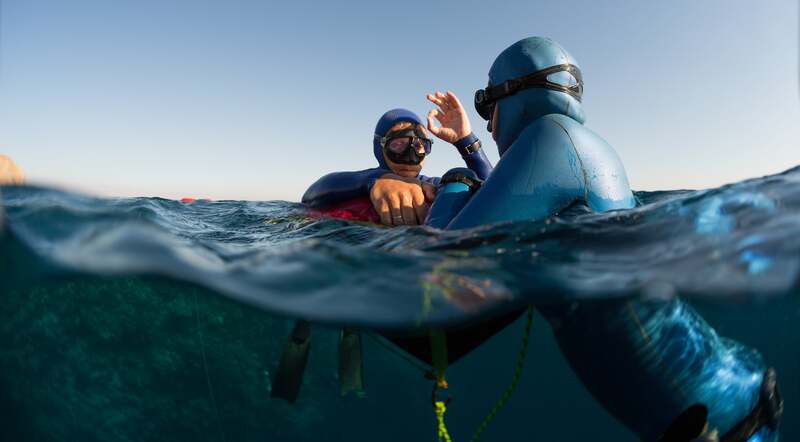 Despite the relative lack of equipment, there is much to learn when freediving, especially concerning safety, techniques and being aware of the risks – getting it wrong can be fatal. A badly trained freediver risks suffering anything from ear, sinus and lung barotraumas, to blacking out and subsequently drowning, not to mention decompression sickness. We’re not trying to scare you or dissuade you from giving our wonderful sport a go, though, but it’s crucial that you safely learn to freedive with a qualified and insured instructor. Many highly-experienced freedivers and spearfishers who have not completed a course find that they are often doing things that are dangerous and inefficient. On completion of a course, they find that their ability skyrockets, as well as their confidence, knowing that they are finally doing things right – and safely. There are also specialist freediving courses where you can learn how to compete, be a competition safety diver, be a freediving judge, use a monofin, how to selectively fish, and take photos underwater among many other skills. Your instructor will have taken several freediving courses themselves, culminating in an instructor course lasting at least seven days. They will have had to perform difficult rescues and dives and be experienced in dealing with all kinds of scenarios. There is nothing like learning from an experienced instructor and they will be fully insured, representing a dive center or agency, and carry first aid and oxygen with them in the extremely unlikely event of an incident. If you do not have any equalization issues and are confident in the water, it may seem easy for you to progress deeper without instruction after your first course. However, as you go deeper, there are additional risks associated with increased depth. Without taking a relevant course, it’s more likely you will suffer an accident, most commonly a lung barotrauma. Founded in France in 1992, this is an international organization run by volunteers that set course standards, ratifies world records, trains judges and organizes competitions. Founded in Italy in 1995 by world champion freediver Umberto Pelizarri and Renzo Mazzarri, a world champion spearfisher, Apnea Academy sets course standards. Based in Koh Tao, Thailand, this training center has its own training system and due to its exotic location has certified a large number of freedivers. CMAS is an international organization with branches in countries throughout the world. They set course standards and ratify world records. Freediving Instructors International was founded by multiple world record freediver and pioneer in freediving education, Martin Stepanek, and is the only freediving education curriculum in the world accepted at a collegiate level. An international technical diving agency that started a freediving program in 2000, it does not currently offer freediving on its website but still maintains freediving instructors worldwide. Performance Freediving International is a freediving training agency founded in 2000 by Kirk Krack. Krack coached world champion freedivers, Mandy-Rae Cruickshank and Martin Stepanek. PFI teaches freediving clinics around the world and is involved in both team and athlete development. PADI is best known for being the largest provider of Scuba courses in the world, in 2015 they launched their Freediver programs that take you from complete beginner all the way up to Instructor level should you wish. Founded in 1970, SSI is one of the largest international diving organizations teaching courses ranging from swimming to freediving to tech diving. This is an international organization for setting course standards, organizing competitions and ratifying world records. Continue reading more from the DeeperBlue.com Beginners Guide to Freediving. Emma Farrell is one of the world’s leading freediving instructors and the author of the stunning book One Breath: A Reflection on Freediving. She has been freediving since 2001 and teaching since 2002. She is an Instructor Trainer with RAID, SSI, and AIDA, a founding member of the AIDA Education Commission and has written courses that are taught internationally, as well as her own specialty courses such as her course for surfers, spearfishing safety skills course and Gas Guzzler course. Please provide address/contact #'s of free diving schools in Miami/Ft Lauderdale area. Please take a look at http://www.freedivingcourses.com - that is where you can find freediving course providers in any location. Somehow reading articles about something written by someone with connections ties and interests in the commercialization money aspect makes it less of a trustworthy article really. If you have no diving skill or knowledge being taught by most experienced freediver and even more important not just a so called world champion but someone who is good at teaching and tutoring is all that matters. I know courses where you can get to highest level in one step if you are experienced with basic skills and have water experience and such beforehand. This will probably save you taking step one two and so on to get to the level you actually are at and comfortably achieve. So for me the question is more complex than the resounding yes in the article above.